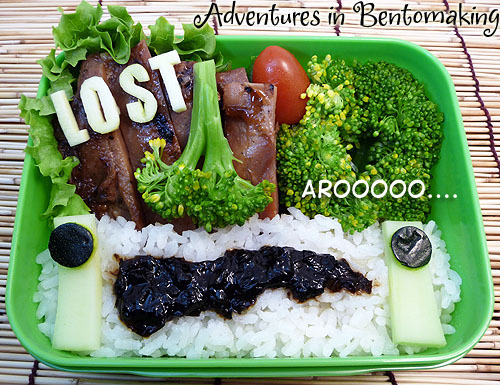 Since today is the day I could theoretically have been on some Lost set, I woke up really pouty and uninspired for a Lost bento. The kids must be rubbing off on me, since I’m acting like a 4 year old. Anyway, I thought of something on the fly and made some really weird looking bento that Mr. Pikko didn’t even get until I explained it to him. All of my moping and pouting came to a dead halt when I went to check the mail this morning. We’ve been waiting to hear back from schools where we applied for a district exception for Baby Girl and so that’s why I went. Unfortunately, there were no letters from the schools, but I did have something else that made my day OH SO MUCH BETTER! Yeah, that’s right! 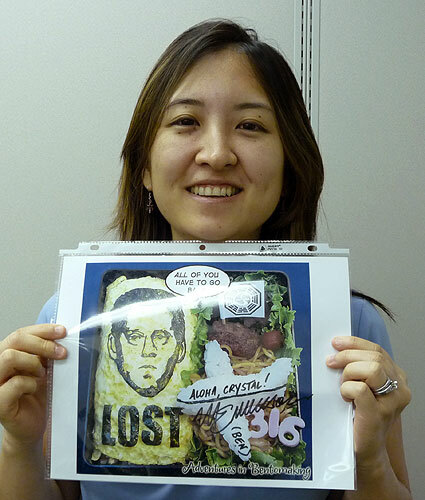 My aunty’s package to Michael Emerson got through and he autographed and mailed the photo of my bento back to me! Is that not just the most badass thing ever? And even better, it arrives on the day I really needed a pick-me-up too. I’ve heard through the grapevine that Mr. Emerson and Terry O’Quinn are the friendliest of the cast, but it’s still really cool to get something like this. I will have to give my Aunty like 50 hugs to thank her the next time I see her. You’re the bestest Aunty C!! This definitely needs framing. Woohoo!! So good! On a side note, he’s got nice handwriting! At the top I have more leftover Korean bbq chicken with a broccoli “jungle” on the side. One tree has been flipped upside down by the smoke monster and thrown onto the chicken. I made the LOST letters out of zucchini. 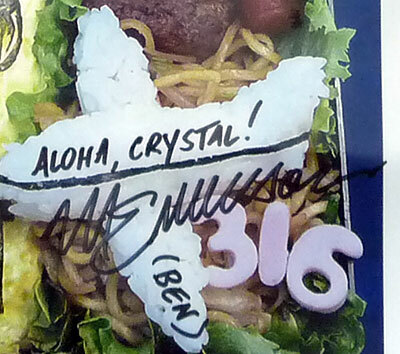 Lesson of the day: Autograph from Creepy Ben totally trumps lost Lost extra opportunity. If you need me, I’ll be floating around in the clouds.